Hellooo foodie friends. Today is an ultra special Monday because I’m sharing the kind of deliciousness you should start your week with, every week. 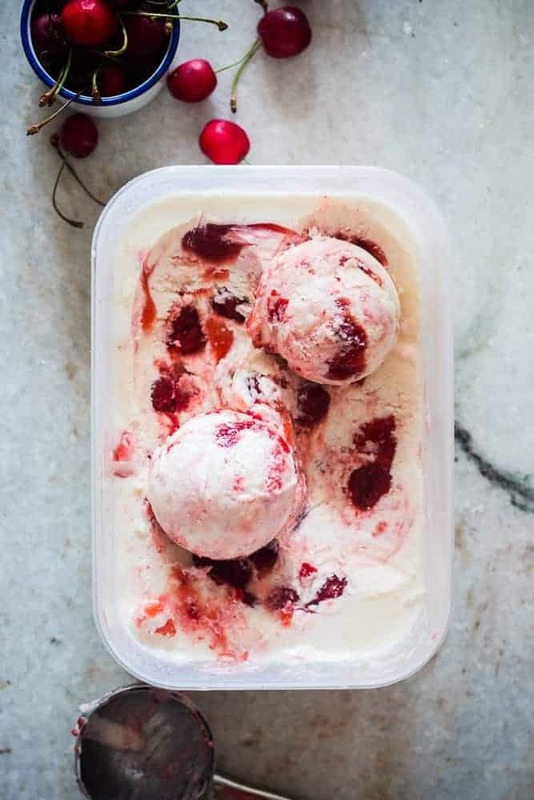 I’ve been having this lychee cherry swirl ice cream for breakfast, lunch and dinner. Because it covers my daily intake of fruit. Or that’s what I’ve been telling myself. Kidding. But that’s not the only reason today is special, this lychee cherry swirl ice cream is also part of an amaaaazing #icecreamweek where a bunch of my must-follow food blogger friends and myself are hosting a GIVEAWAY with some amazing prizes including an Ice Cream Maker from Cuisinart, an Ice Cream Scoop from Zeroll, Vanilla from Rodelle, Containers, Popsicle molds, and a Scoop from Tovolo, and the Sweet Cream and Sugar Cones cookbook which has 90 delicious recipes for making your own ice cream, plus a few more surprise goodies. Soooooo exciting riteeee! This giveaway is only open to US residents but I’m doing my best to host one for my Indian readers as well. GIVEAWAY CLOSED. So if you are in the US or know anyone who is, share share share! I really hope one of you wins this huuugeeeee bagful of goodies, and make sure to let me know when you do! 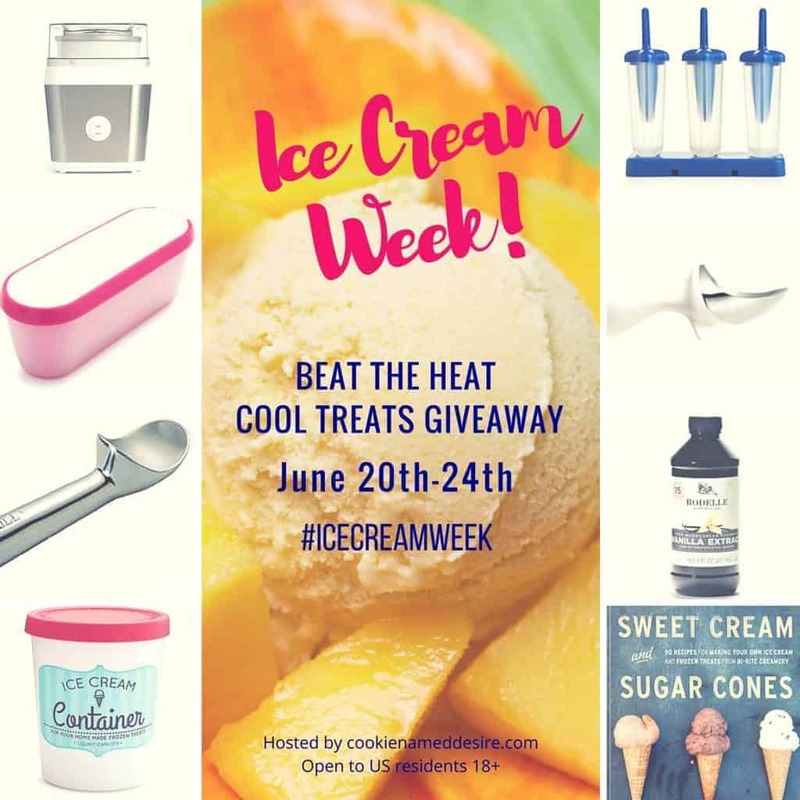 While hosting this giveaway is going to be tons of fun, let me tell you shooting ice cream is the hardest. I’ve been running to and fro between the fridge and the living room trying to keep this ice cream from melting before I was done. MAJOR FAIL. I finally gave in and ended up eating my way through the melty gooey ice cream which is the best kinds. When it’s all squishy and mildly frozen like a soft serve. And you know whats even more awesome? While the ice cream was all melty and creamy like, there were still bits of frozen cherries in every bite and just a hint of lychee. I was in ice cream heaven. It’s sad that for all the ice cream I make, I don’t have an ice cream maker. But this no churn, eggless ice cream base works so well that I’ve never really wanted one. It’s a simple ratio of 2:1 Heavy Cream to Condensed Milk and is a no-brainer. You take some heavy whipping cream and condensed milk and whip it till light and fluffy (we are not looking for any stiff peak business here), fold in your favourite flavor and dump it all in a freezer friendly box to freeze overnight. That’s it. Whoever invented this stuff is genius. Because all you are left with is the creamiest, lightest, most flavorful ice cream in the world. Perfect for no-ice cream-maker people like us. Are you a soft serve fan or a frozen scoop fan? I’d love to hear your favorite ice cream story! Don’t forget to enter the giveaway above to win some exciting goodies! 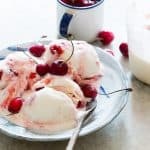 This eggless, no ice cream maker, no churn lychee cherry swirl ice cream is the best way to beat the heat this summer! With just 10 mins of prep, this will become your go-to ice cream recipe. Puree lychees in a blender till smooth. Whip together cream and condensed milk till light and fluffy, about 3-4 minutes. Whisk in the lychee mixture till combined. Pour into a freezer friendly container, cover and freeze for about 1 1/2 hours. In a saucepan, add cherries, sugar and water. Bring this to a boil and simmer for about 10 minutes till the cherries have broken down and the mixture is slightly syrupy. Let this cool while your ice cream freezes. 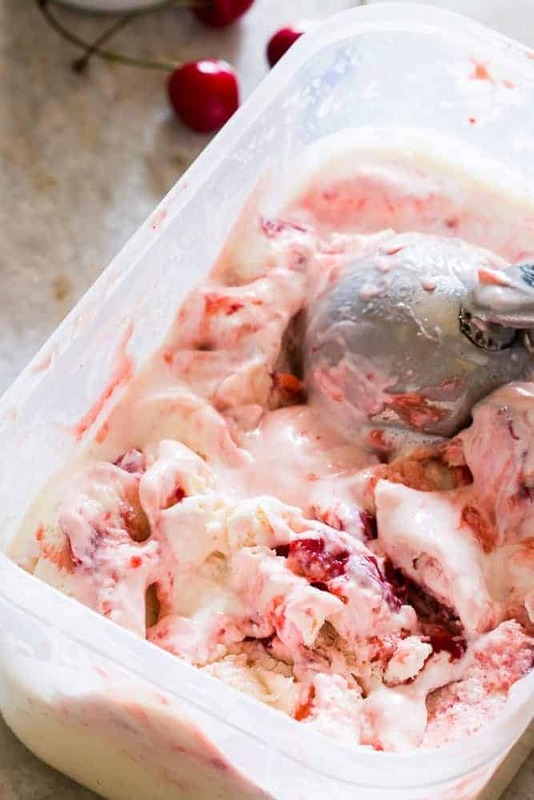 After 1 1/2 hours, take your ice cream out of the freezer (it should be semi solid by now with the sides more frozen than the center) and add your cherry mixture by the spoonful in different parts of the surface of the ice cream. 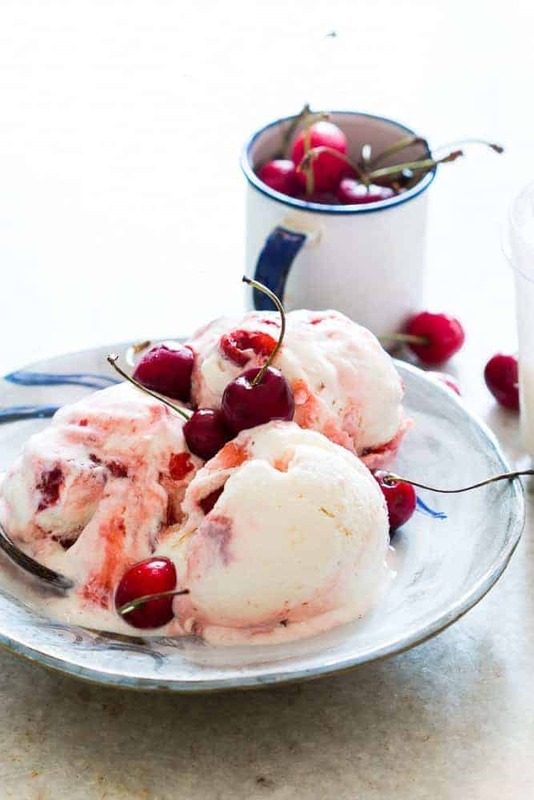 Use a fork to swirl the cherry mixture into the ice cream without mixing homogenously. Cover and freeze overnight. I didn’t need to thaw it before serving because this ice cream is really smooth and creamy, but just in case you do, leave it out on the counter for 5-7 minutes before serving. Top with more cherries or lychees and enjoy! This ice cream looks delicious and sinful. Please have some giveaway for us too. My mouth is literally watering right now! Looks absolutely amazing! I love homemade vanilla ice cream ♥♥♥ The ice cream looks fabulous! Just found your blog a few days ago, can’t wait to explore more recipes! Your site is beautiful. Thank you so much Jaweriya! Thanks for following along Codi! OMG! You got my attention at ‘no ice cream maker’ and ‘no churn’. Lychees are my favourite fruit! This looks delicious and sinful. Please have some giveaway for us too. i love cherrrry flavored desserts…and this no churn business is a deal breaker!!! !